23rd June, 2015: The day started at 11 am after some sleep from last night. Today I began by first ordering the files and images taken last night in proper sequence. The previous week instructors had stressed on the fact that to be a good astronomer/scientist/professional you need to follow a discipline in the way you do work. And that is what I saw in them. Every night they took images, they used to name them in such a way that the file name would contain the name of object, date, filter used, sequence number and such things. I did a similar thing last night and I found out that sorting your files becomes much easier than ever. At lunch time I met Bob who had worked with Jacqueline till 4am last night on her observations of a variable star. We discussed the possibilities of making use of her data for doing the colour transformations I need to do. However it was too cloudy last night and that could filter out a lot of useful light. We figured out that Jacqueline’s data if taken tonight will be useful (provided its clear) as we can get the APASS data for the colour magnitude for different stars. Also, we had to bring data for Garret’s asteroid as promised to him. So we chalked out a plan that after dinner we will first work on measuring the dark current against temperature, then take Garret’s asteroid and finally Jacqeline’s variable star. After lunch, I visited the SNOW solar telescope where Prof. Sara Martin was working with Mihyun on her project of determining the solar rotation. The previous evening Sara had said that she was having problems focusing the sun using her camera attached to a 3 inch telescope. So I went to help and see if we could improve things. They have a 2.5x Barlow and I attached that to the camera and telescope to see if we could bring the focus point out (as the focus tube was almost touching the primary tube). It was working but the screen of Canon 20Da was not having live view and it was extremely difficult to get any convincing view of focused sunspots. So we decided to go with the previous setup without a Barlow and instead take images with the sunspots being a little out of focus. That still works as their position can be quite well determined in that focus. 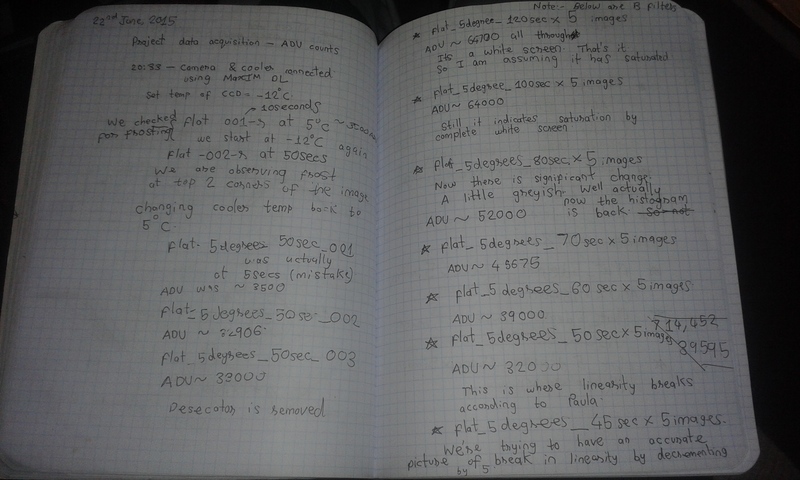 After the SNOW, I went to the library to begin with the analysis of previous night’s data. The software MaxIM Dl and AutoStar IP are useful for doing photometry. My aim was to reduce the data for the ADU vs exposure experiment. I was trying to find a convenient way to find out pixel intensities for a given pixel for about 100 images. And soon in MaxIM Dl I found a tool called “Line Profile” which plots an intensity profile for a range of pixels. I found a very nice option called Horizontal line. It sets a line say at y=500 and plots the intensity of all pixels on that line. Then it can save a Comma Separated Value file in MS Excel from where you can choose a pixel number and find its intensity. It’s a very tedious process and took me an hour to just do that. Once the data was reduced, next was to analyse it. I took an average of all points I had for a given exposure and pixel and then plotted that against the exposure. And boy! The curve was perfect as expected! I don’t know how but I jumped exactly like MS Dhoni did after winning the champions trophy in 2013. Bob and Natalie went down the hill today to meet Garret and he is improving. 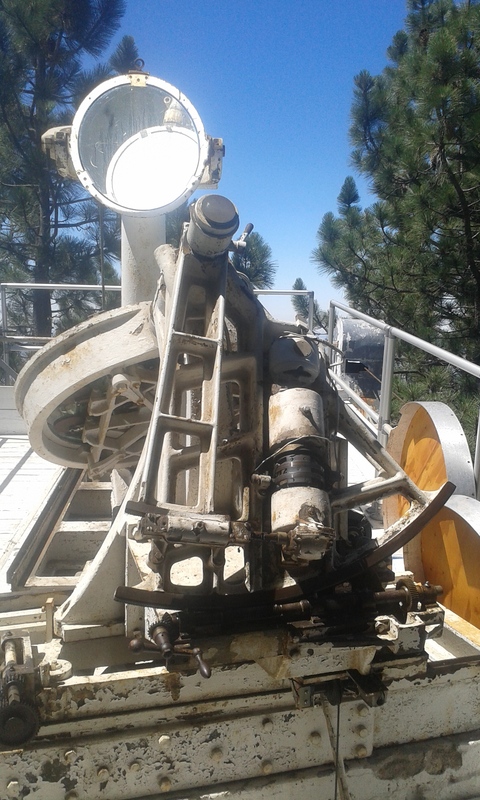 In the meantime I went and helped Paula and David to close down the SNOW telescope. They had got their line of interest for the Zeeman splitting in the 3rd order and were quite happy with their day long efforts. To close the SNOW telescope is a fantastic experience. Why? You get to understand a 110+ years old technology and see how it was built then. You have to manually switch off everything and do some muscle work in pulling the shed to cover the telescope. The old gears, drives, shafts and levers just remind you of the kind of work people did then. Bob and Natalie had bought some lovely pizzas on their way back for dinner. After dinner I went with Bob to the 16 inch dome to begin with my dark current observations. We began with the CCD temperature at -13 degree Celsius where it was stabilizing without consuming much power. The aim is to take about 5 images of 20 second exposures and vary the temperature by about a degree. I did it for an hour till -3 degree Celsius. It was dark enough for us to begin with Garret’s asteroid and so we synced the telescope to the given asteroid and began taking exposures. In the mean time I began with the data reduction of the uniformity check which is the second experiment I performed yesterday. It is definitely a tedious process but its worth it. I used the area plot method this time whereby the software determines the x and y value of the pixels and plots their intensity. Since in this experiment there is only one star in the field its easy to know the peak level is from that star. Meanwhile, the asteroid’s shift in position was becoming quite evident and its great to see its movement after comparing a few images separated by 2 hours of time. By 1:00 the asteroid had moved a lot and I met David at the galley to eat some food. His Zeeman splitting had come out quite good. We then changed the coordinates to go to a RR Lyra star in Lyra on which Jacqeline Is working on. From then on till 3 am we started imaging the variable star AQ Lyra which has a period of about 8 hours if I am not wrong. Her data will be useful for my colour transformations as it contains a lot of stars in that field of view and I also will be able to get the standard photometric magnitude from APASS (AAVSO Photometric All Sky Survey). Its about 3:30 am and I am hitting the sack.